Jericho Brown has spent much of his life in the South, most of it Deep. He was born and raised in Shreveport, went to college and graduate school in New Orleans, completed his PhD in Houston, and now lives in Atlanta, where he serves as an associate professor of Emory University. In the American Book Award-winning Please (New Issues, 2008) and the Anisfield-Wolf Book Award-winning The New Testament (Copper Canyon, 2014), he describes the complex and sometime conflicted experience of living as a black, gay, spiritual man in a country that often sets these identities at odds. His poems, which have appeared in The New Yorker, The New Republic, and Best American Poetry, among other publications, frequently allude to romantic love, popular music, evangelical Christianity, and black experiences of all kinds. He will be at the Hugo House in Seattle on November 10 for the Hugo Literary Series. I corresponded with him last month. Alex Gallo-Brown: It’s been almost three years since The New Testament appeared. Since then, you’ve had several poems making the rounds on social media, including the stunning “Bullet Points.” Do you have a new book in the works? Jericho Brown: If writing poems means I have a new book in the works, I do indeed. I don’t like to think of it that way until I have some good number of pages behind me that tell me what I’ve been thinking. And I’d never try to write toward some theme as if I already know what I’m thinking. The writing itself tells me what’s really been on my mind. I’ll get to about 50 pages of poetry or thereabouts, and then I’ll start wondering about theme and book. But if I think about that now, it would make whatever I write much too directed and most likely very shallow. Three years doesn’t seem to me a lot of time at all—not for a book, not for a book of poetry. I think of poetry books as books I should be able to read over and over. A good one can hold me a lifetime, so there’s no need for me to be thirsty for another from whomever wrote it. The important thing is making the work that only I could make. There’s no rush. I have long hair and a nice smile, but I’m not a pop star. I’m a poet. Time works for me in ways Rihanna won’t ever get to experience. Speaking of pop stars, you recently wrote a profile of the Atlanta-based rapper Future for the culture magazine Flaunt. Can you tell me how that came about? I’m fascinated by black art, and taken by the fact that black music is the facet of that art to which almost everyone in the world has direct access. I sit around thinking about how our music (and our poetry and dance and painting, etc.) shapes culture in the United States and abroad. Let me be clear: black music doesn’t just report or speak back to culture. It creates it, produces what we think of as the way we live, and it’s done this in the United States for people (first for black people, then for white people, too, and now for some of er’body) since the work songs first came out of the mouths of slaves across fields between the 17th and 19th centuries. Let me be clear: black music doesn’t just report or speak back to culture. It creates it. Every form of black music in our nation has its life among black people until white people become attracted to it. They then figure out ways to have white people perform that music so that it is properly packaged for a much more intense capitalism. At that point, black people go and create another form of music that is all their own. The earlier form either becomes much less popular to wide audiences, e.g. jazz, or it becomes popularly known as white and completely co-opted by white folks, e.g. rock-n-roll. Hip-hop has my attention right now because, given what we know about past musical forms and the ways they get co-opted by capitalist culture, it must be at the beginning of its end. I want to watch it go closely. I want to have my ears open to hear the very beginnings of whatever music we make next. It seems to me that Future is an artist [who is] interested in the disjunctive nature of actual experience. I feel a kinship to the leaps he makes in songs, as they are like the leaps I mean to make in poems, and I like the way I can trace his brand of hip-hop more directly back to the blues, which is not a narrative form in spite of the fact that it tells a story. So Black! I should probably add, though, that something about that article seems dishonest in that I wrote it without mentioning just how fraught my own relationship to hip-hop really is. I hint at it, but maybe I should have said it more directly if I mean to be a good man. As a listener, I love plenty of it, but I do believe it is and has always been a misogynistic and homophobic form. It has always used women as objects, and it has always used gay folks as a metaphor for the worst existence anyone on the planet can have. It’s also oddly open about material things being the most important things and the only signs of a successful life. You talk about freedom in the article, the idea that money can represent a way of being free in a country where almost nothing is actually free, particularly for people who are black. You have also written, “Thinking and talking about freedom is only of use to me as an artist—and I submit only of use to us as human beings—when we can understand it as a complement to and not a contradiction of responsibility.” Are you thinking more about freedom now because of the current sociopolitical situation? Maybe now more folks will come to know that poetry is not entertainment. Though poetry may give pleasure, may even be delightful, it is not entertainment. I don’t know when I wasn’t thinking about freedom, as I have always been aware of myself as the literal descendent of slaves and sharecroppers. The current sociopolitical situation is really just a moment when some white folks are suddenly aware of what people of color have always known. And the uproar about the current situation proves that even the most well-meaning of these people never took heed to anything Gwendolyn Brooks or Allen Ginsberg or Adrienne Rich ever said. Maybe now more folks will come to know that poetry is not entertainment. Though poetry may give pleasure, may even be delightful, it is not entertainment. No, not entertainment and not a place for absolute freedom, either, if it means freedom from responsibility. It feels like we are living in a time when historical oppressions and dynamics are becoming more apparent to the beneficiaries of those systems than they were before. Do you feel some frustration with this nascent “wokeness”? I did. Actually, I was really hurt by everyone’s sense of surprise. If you characterize your reaction as surprise, it seems to me to mean that you never fully believed what women and queer folks and people of color and poor people and differently abled people were saying about their lives. Worse, it often means that these people did not believe one another. I’m not so frustrated now. I just wish people would stop being flabbergasted all the damn time, so they can, instead of being shocked, take some kind of action that actually shows they have some skin in the game. I wish so-called “good white guys” would do more visibly dangerous and risky things to show that, as so many say, “not all white people” are okay with things as they are now. I wanted white guys to get together and lie down in the yards of the Electors before they did a dumb thing. I’ve wanted good white guys kneeling in the bleachers when the National Anthem is played. Some show of solidarity at least would be nice. Some acting a renegade fool would be better. People keep saying the nation is too divided. I think it’s not divided enough, at least not evenly. There aren’t enough vocal and powerful people on the right side of things. When black people illegally knock over Confederate monuments, or illegally scale poles to take down Confederate flags, I mostly just wonder why nobody white was hurt enough to do the same. And then I don’t wonder. I could think that white folks are okay with things as they are, and are incapable of feeling anything for anyone who they assume they don’t share identity with. But that’s something I’m not supposed to think, right? I’ve wanted to see white people do dumb and crazy and dangerous and risky righteous things since I was a kid. I never have. Will I ever? Of course, white folks do seem capable of doing outrageous stuff, like those tiki torch white supremacist idiots in Charlottesville and elsewhere. Isn’t it interesting that they feel so much fervor that they are willing to embarrass themselves? People keep saying the nation is too divided. I think it’s not divided enough, at least not evenly. There aren’t enough vocal and powerful people on the right side of things. And in a way, there can only be so many powerful people on the right side of things, since that side is necessarily anti-capitalist. It’s all quite frustrating, you see. So this is why I love poems. The writing and the reading of poems create a space of timelessness. The trance is one where you can organize and re-vision the current fears that surround us. Reading and writing is not checking out. These are acts of survival. They allow us space and time to remember ourselves whole and thoughtful in spite of a world that means to slice us up or make us numb. 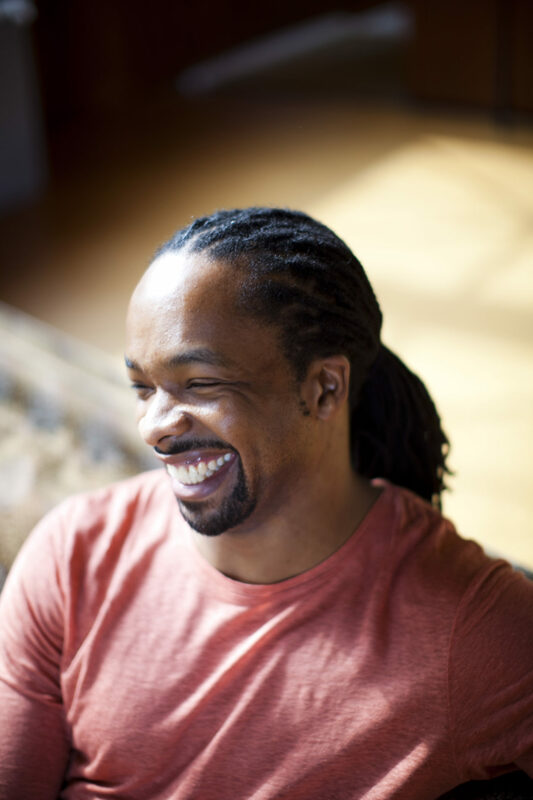 Jericho Brown is the recipient of a Whiting Writers’ Award and fellowships from the John Simon Guggenheim Foundation, the Radcliffe Institute for Advanced Study at Harvard University, and the National Endowment for the Arts. Brown’s first book, Please (New Issues 2008), won the American Book Award. The New Testament (Copper Canyon 2014) won the Anisfield-Wolf Book Award and was named one of the best of the year by Library Journal, Coldfront, and the Academy of American Poets. His poems have appeared in The New York Times, The New Yorker, The New Republic, Buzzfeed, and The Pushcart Prize Anthology. He is an associate professor of English and creative writing at Emory University. Alex Gallo-Brown is a writer living in Seattle. His essays have appeared in Los Angeles Review of Books, Lit Hub, Electric Literature, Salon.com, and The Rumpus, and his poems can be found in Tahoma Literary Review, Pacifica Literary Review online, The Good Men Project, and The Weekly Gramma, among other publications. Last year, he was a teaching artist with Seattle Arts and Lectures’ Writers in the Schools.